Cryotherapy for mesothelioma works by freezing cancer cells to delay disease progression and often accompanies surgery. Cryotherapy is currently being tested as a treatment for pleural mesothelioma. Cryotherapy consists of freezing cancer cells and can be used for localized tumors. Clinical trials have found cryotherapy causes minimal side effects. Researchers are working on improving the efficacy of the new treatment. Cryotherapy, also referred to as cryoablation, is an emerging mesothelioma treatment that uses extremely cold temperatures to destroy cancer cells. In clinical trials, cryotherapy has been tested for malignant pleural mesothelioma and shown some success at delaying tumor growth and progression. Current studies are actively working on improving the treatment for mesothelioma. Cryotherapy works by damaging mesothelioma tumors at a cellular level. It’s considered a localized treatment, as it is applied directly to solid tumors in specific areas of the body and can not be easily applied throughout the body, like systemic chemotherapy. As such, cryotherapy will likely not be an option for patients with advanced stage mesothelioma, as the cancer will have spread too extensively for the treatment to be effective. Cryotherapy works by establishing a “cryofrost” over the impacted area and a little more, generally at least 5 mm bigger than the tumor or damaged tissue to ensure all the cancer cells are being treated. The treatment is applied by a cryoprobe – a hollow tubular instrument that passes either liquid nitrogen or argon gas directly to the tumors or damaged tissue. The extreme cold, with low temperatures that drop even below -200 degrees, freezes the cancer cells and kills them, especially with repeated application. With the assistance of imaging tests to guide the application, the doctors work through a process of repeatedly freezing, thawing and refreezing the cancerous tissue. Depending on the size of the area, the process may take several minutes or even hours. After the procedure, the frozen tissue can be surgically removed, though with this type of treatment, the cancer cells may be broken down by the immune system and white blood cells and reabsorbed into the body. Cryotherapy already has shown success in various cancers including skin cancer, breast cancer, and kidney cancer, as well as other skin conditions and rheumatoid arthritis. Early-phase clinical trials for cryotherapy and pleural mesothelioma have shown the treatment can be safe and effective. A number of clinical trials have tested cryotherapy for pleural mesothelioma, and shown varying degrees of success so far. Most recently, the Mayo Clinic is currently testing cryotherapy as a neoadjuvant therapy to surgery two weeks after cryoablation. Researchers will be observing how 2 or 3 applications of cryospray during a pleuroscopy (a minimally invasive procedure to observe the pleural cavity) will impact the ability to surgically resect any remaining tumors or cancer cells after a recovery period of about 14 days. In the past, cryotherapy has been tested for mesothelioma for cases of recurrence, which is rather common among mesothelioma patients, and in many instances, recurrent mesothelioma is even more difficult to treat. A recent clinical trial observed 24 patients with a median tumor size of 30mm from 2008 to 2012, who altogether underwent 110 cryoablations guided by CT scans. Overall, the researchers determined the treatment was safe, with minimal side effects observed in the time period. The clinical trial also proved successful in slowing disease progression and extending survival. A similar clinical trial tested the efficacy of cryotherapy for recurrent pleural mesothelioma for patients who had previously undergone aggressive surgery, particularly pleurectomy/decortication. For the 24 patients in the study, disease-free survival was 24.5 months on average. Collectively, the patients had 107 tumors to be treated with cryotherapy. The patients were typically treated with two probes working together to freeze the mesothelioma cells, with an average of about 25 minutes per lesion. Researchers noted the area of tissue that had to be frozen had a median of about 6.5 mm. Following one round of treatment, researchers found 95.3% of the treated tumors had a complete response and halted growth and led to a median survival of 11.4 months. With several rounds of the minimally invasive treatment, the patients increased overall median survival to about 36 months. Since the trials are still in their early phases, there is only a small dataset of patients who have undergone the treatment, so it will take more testing to better understand the safety and efficacy of cryoablation. With the success of these early tests, however, researchers are hopeful the treatment can be another great tool for mesothelioma. Though clinical trials have noted that overall cryotherapy appears to be a safe treatment, like with any cancer treatment, there are risks involved. In general, doctors note the risks of cryotherapy can be less severe than other traditional treatments, like radiation. Side effects from cryoablation will also vary depending on where the treatment was applied. When considering the risks of cryotherapy, mesothelioma patients should also weigh the benefits of the emerging treatment. 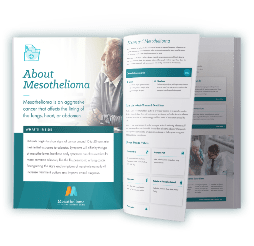 Many aggressive mesothelioma treatments, like the various surgical options, are invasive and have a longer recovery time, as well as many more risks. Since cryotherapy treatment is a minimally invasive procedure, patients have a much shorter recovery period and often face less side effects. The success of cryotherapy can also be monitored in real time, as doctors watch the progress through imaging scans as the therapy is applied. Researchers have noted the treatment is also safe for repeated use, which can be especially important for cases of recurrence. It might be an option for patients whose cancer is not responding to traditional treatments, like chemotherapy. Studies are also exploring cryotherapy as a means of treating unresectable cancer or cancers at more advanced stages. Researchers hops with further testing, the role of cryotherapy for mesothelioma will become clearer and the success rate will continue to improve. 3 Cameron RB, Farhadi R, et al. Cryoablation as an adjunctive therapy in a multimodality treatment program for malignant pleural mesothelioma. Journal of Clinical Oncology (Meeting Abstracts). 2010; 28: e17531. 4 Downie GH, Faucet R, et al. Spray Cryotherapy for Intrapleural Malignancy. C44. PLEURAL DISEASE II -- CHEST TUBES, MANAGEMENT, PATHOPHYSIOLOGY. April 1, 2009, A4480. 6 Mayo Clinic. Intrapleural Cryotherapy for Malignant Pleural Mesothelioma. 7 National Cancer Institute. Cryosurgery in Cancer Treatment. Page last modified on August 23, 2018.